Volume XV - Issue 1. 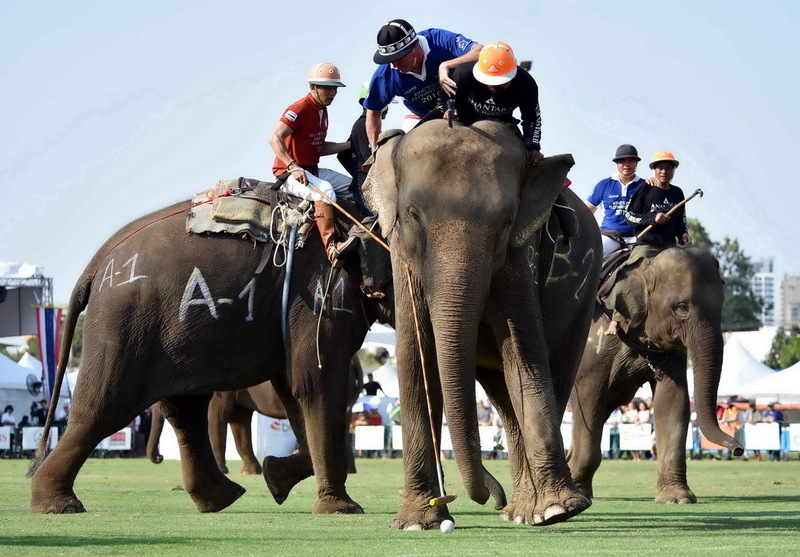 The Newsletter for Horse Polo in Thailand. Caution - not all are welcome, check first. 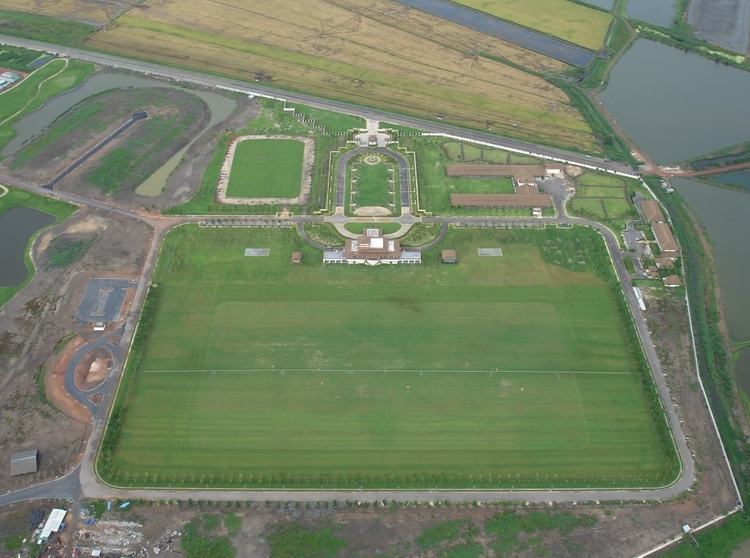 VS Polo Club is 15 minutes from Suvarnabhumi Bangkok Airport -- You are welcome to come and play with us. Last year's final was a mighty duel between King Power and Mekhong with the Mekhong team taking the King's Cup in the final seconds of the match. This year will certainly prove to be no less exciting. The following teams have confirmed for 2018 KINGS CUP. After a 2 year hiatus, the beloved "Hornito Cup" has returned to the field in the Kingdom of Siam. And this year.... Suddenly, and without warning, The Black Dog Team was back. It was the first appearance of Texan Jamie Demericas on the infamous team, but he withstood everything that SPP could throw at him. Mat Mar was in command of the SPP team and no one in the world practices more than Mat. Jamie who has arrived from Texas has been practicing with gauchos Juan and Gaston for several months. He was on form today with solid passes downfield and learning to join the line before going for the ball. This year, Senorita Hornita herself made an appearance to present the coveted cup. 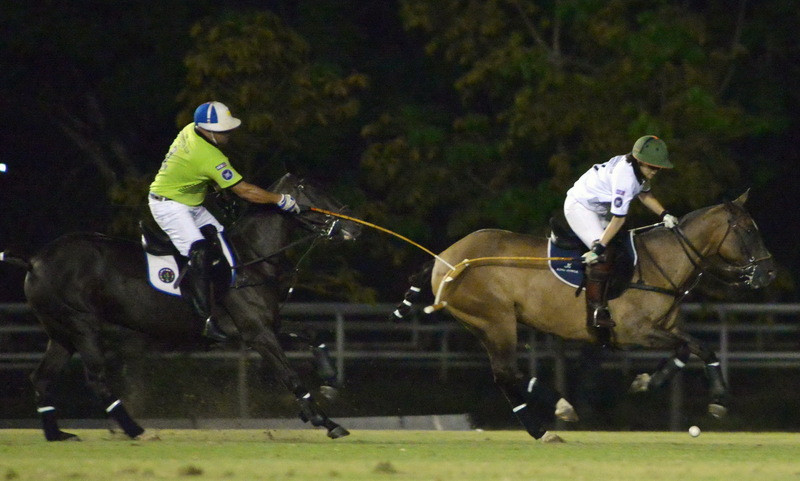 It was Black Dog's for the taking, but in the final seconds of the final chukka, Mat Mar awoke from a long sleep and drove the ball at incredible speed almost 30 yards between the goal posts to equal the score 4-4 seconds before the final bell. In the true tradition of the Hornito Cup, the gauchos settled around the cup to cook some steaks after the match. Khun Mau and Amigo Tsu were on hand to partake of the offerings. 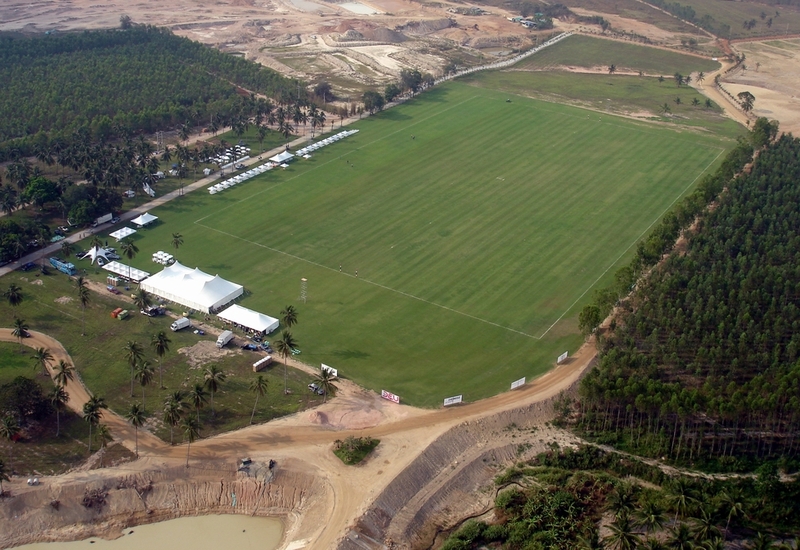 This is the first year that Old & Original Siam Polo Park -- where it all started -- has been on the Thai Polo circuit and the field is in excellent condition. Anyone interested in coming to play, the gauchos Gaston and Juan are on hand to give lessons and eat steaks. 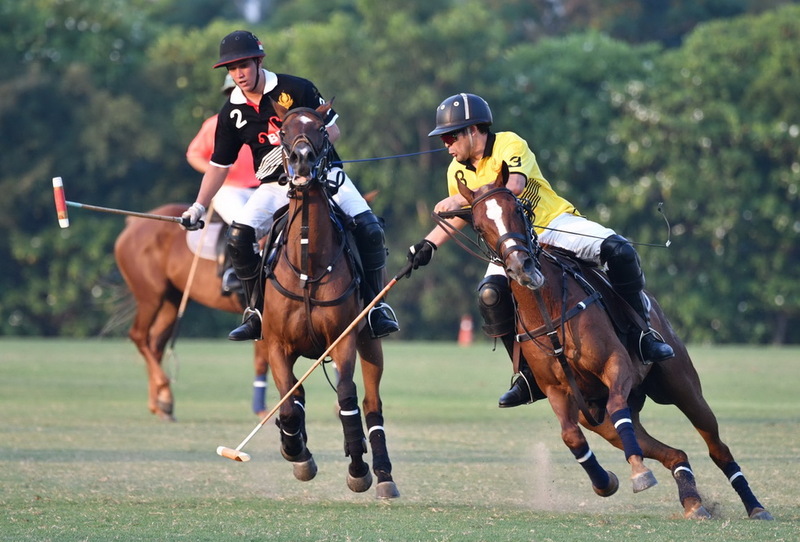 The action moved down to Polo Escape for the Chinese New Year with 3 eclectic teams on the field. The one to watch was definitely La Familia from Malaysia, with none other than the Sheik-Rattle -And-Roll Reissman himself in command of the team. Sarah Wiseman had returned from her epic performance in the King Power Ladies Tournament to take the field for Kuppa. However, she had a serious encounter with a seafood dinner the evening before, so after holding Paisano Escape to a single goal lead, she had to retire for the second match against La Familia. Alice Gipps was showing tremendous improvement and giving Nico Pepperoni and the gaucho Mike Taylor a terrible time. Marie Leng was a strong attacking player for Paisano, but she was having pain in her elbow, so we pulled out the "magic spray" which Tom had found by accident in Sriracha and miraculously, it worked. For sure, the MIP of the tournament was Patron Cliff. Not only has he been working out in the gym, but he has been learning the finer points of the game and was able to mark Gines Junior away to the side of the field so Nico Paisano Pieroni could turn the ball around and send down the field. There were thousands of Chinese New Years fans up on the hill cheering on the teams. At the conclusion of Day 1, Kuppa was up by one against Paisano and down by one to La Familia. The Familia and Paisano had drawn, so the tension was perfect going into Day 2. On Day 2, Paisano changed their tune, and took out Kuppa 5-3. La Familia turned the power on and defeated Paisano 5-2. Kuppa, with Sarah back, held La Familia to 4-5 in a fantastic game that could have gone either way. 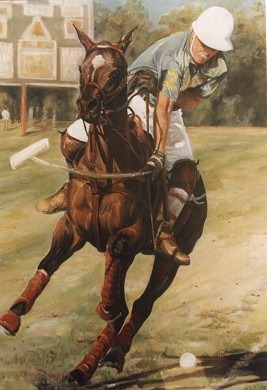 It was a great tournament and Cliff showed us all how to take a tour of the polo field with his horse and without his reins before the chukka -- in similar style to the "Missing Link" from Ellerstina in Australia. 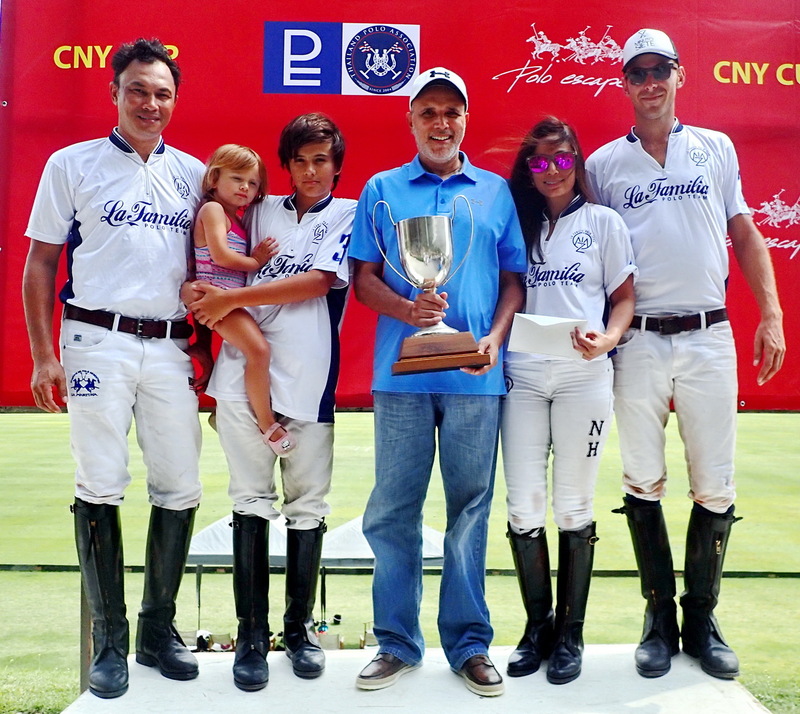 There was a 5 team Ladies only tournament at VS Polo and Marengo defeated La Familia 7-6 to claim the trophy. Alice Gipps was on the scene to capture the action. The Partial All Asia Cup will have only 6 teams this year for a variety of unknown reasons. The confirmed teams are -- THAILAND, BRUNEI, MONGOLIA (Group A) and INDONESIA, PHILIPPINES, CHINA (Group B). This year, each team will be issued 10 "Patron Horses" chosen by the TPA and then the teams will be invited to draw the remaining 10 horses from a hat. The first 2 All Asia Cups, all of the horses were chosen from a hat, but the last 2 All Asia Cups, there has been this new system of "Patron Horses." The tournament handicap is not clear; some say 2-4 goals and some say 4-6 goals. 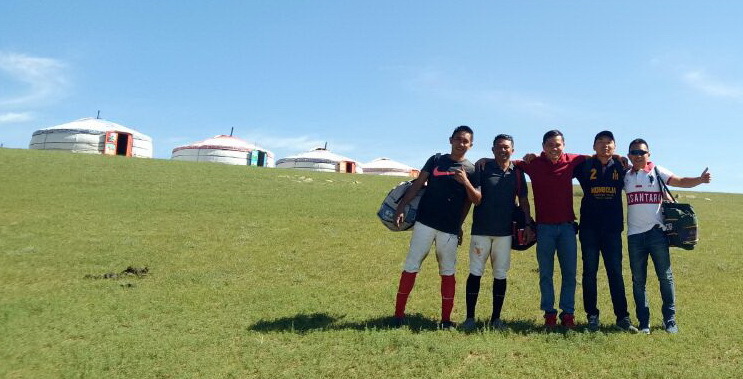 The Mongolian team has been training hard on the Mongolian Steppe, and the Indonesian team (previous winners of the All Asia Cup in 2014) is back in force with 2 new reserve players. This will be an exciting tournament to watch. 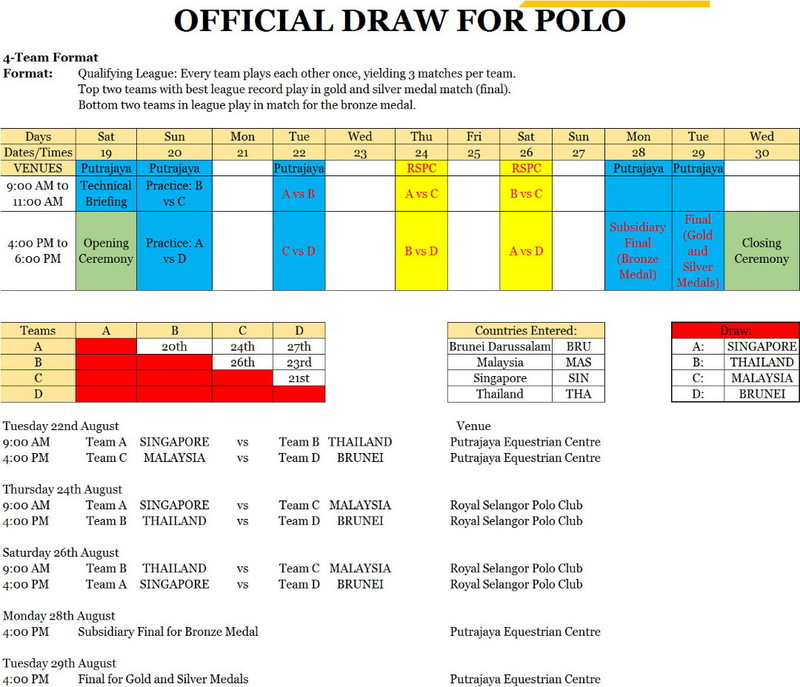 Siam Polo News right now predicts a Final where Thailand meets Brunei under the lights.... but we could be wrong. It could be Thailand vs Philippines. Let's wait and see. 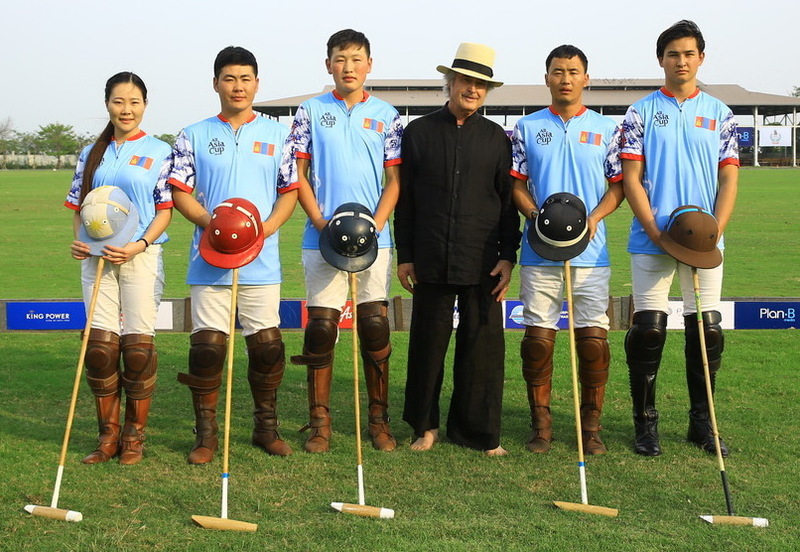 The All Asia Cup was inaugurated in 2012 with a vision that all the teams in Asia could play together and show a united face to the world of their commitment to improving the level of polo in Asia, so that one day polo might return as an Olympic Sport as it was last played in the 1936 Berlin Olympics -- Previous All Asia Cups. And what a match it was... The first game of the afternoon was absolutely riveting with every single fan on the edge of their seats. Brunei and Philippines back and forth with a half goal difference. Brunei surging ahead in the Third chukka. They were on fire. Then Philippines would answer. Princess Azimah playing her heart out as she carried the ball down field and scored. Excellent team play from Brunei with crisp passes and Prince Bahar solid in the back. 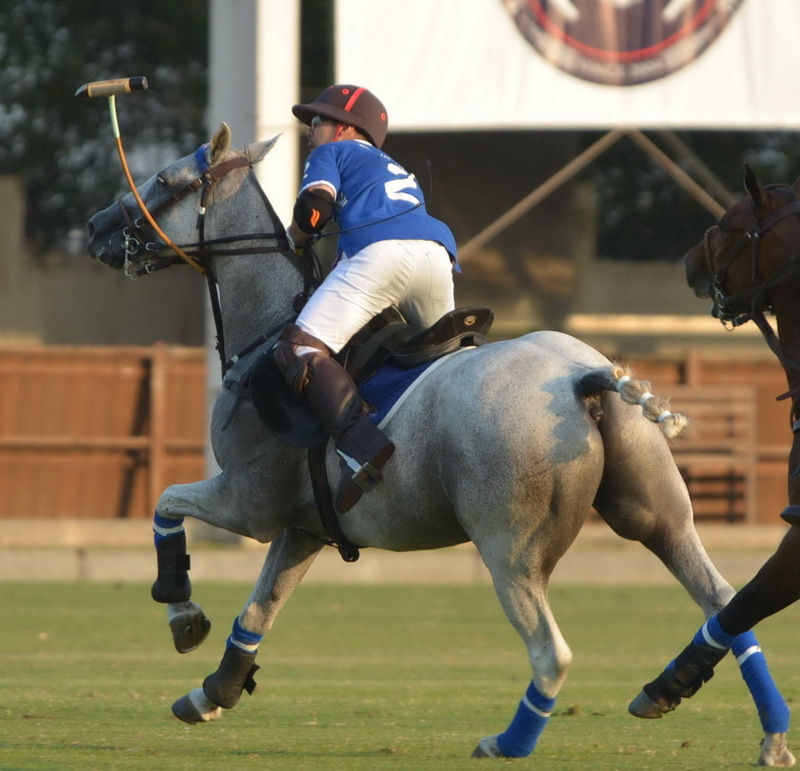 Then at the end of the Third chukka, Prince Bahar seemed to be having trouble with his horse and had two missed hits at the ball. Each one, Philippines was able to take advantage of and score. This changed the momentum of the game. Mikee Romero took the ball down and scored for Philippines. The Garcia brothers connected and commenced the attack. At the final bell, Philippines had taken the match. An incredible Game! The second match of the evening was more difficult to watch. The umpires seemed to have it out for Indonesia from the start. Penalties awarded to Thailand and again until Thailand had a two goal lead. It seemed to rattle the Indonesians, because they couldn't really connect with the ball. Then Thailand began to pummel them from all sides and all angles driving the Indonesians hard into the dirt. Top and Nat were unstoppable, and it looked like Nat might even be put up to 3 goals at the next TPA Handicap Committee meeting. 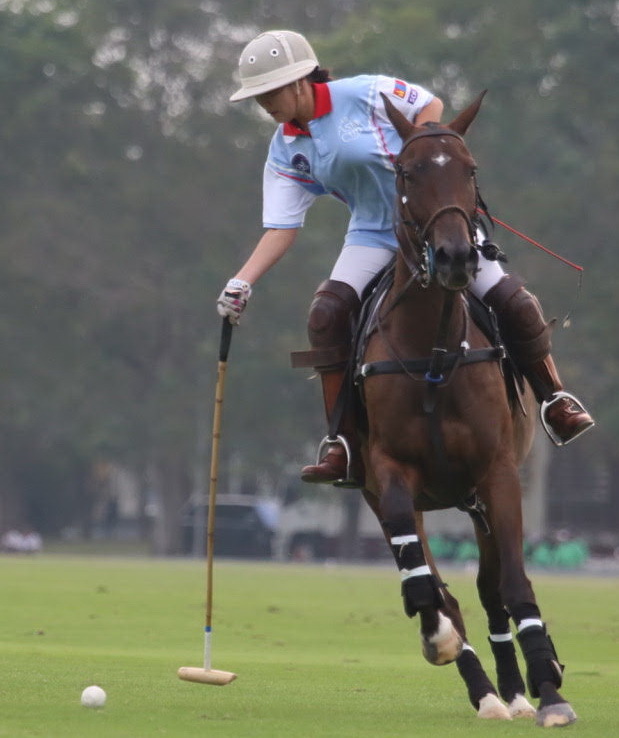 Indonesia was definitely being punished for their Victory in the 2014 All Asia Cup, and at the end of the Third Chukka, Thailand was ahead 9-0 and the Indonesians were looking very despondent. Mas Bowo had flown in the entire families of all the Indonesian players to watch this match. Wives and children on the sidelines, and it was looking pretty grim. At the final bell, the Indonesians had managed to put 3 goals up on the board for a 9-3 final tally. Friday, will see the Indonesians up against the Brunei team for a fantastic BATTLE FOR BRONZE. The Great Wall Match. It became very clear why there is a "Great Wall" (Cheun Chung) between Mongolia and China. The meat-eaters from Mongolia faced off against the rice-eaters from China, and it was brutal. 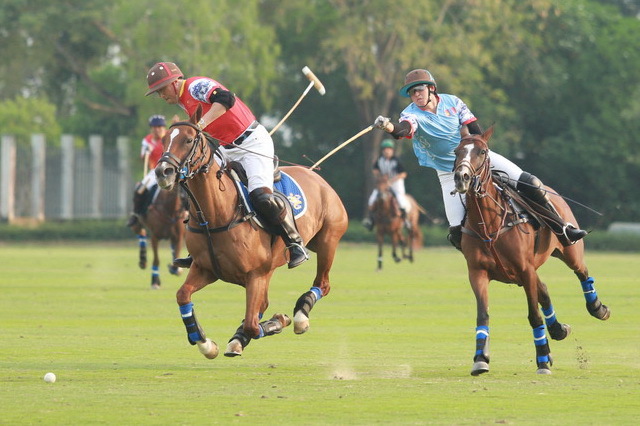 China's Pablo took a fall early in the first chukka, which had him carried off the field. China carried on valiantly. Mongolia playing very good position, and precision back hand tail shots from D'Artagnon put the Mongolians at a distinct advantage. It was somewhat reminiscent of Thailand's dispatch of the Indonesian team the night before and the ball kept rolling through the goal for Mongolia. The Mongolian fans were going wild. "Ano Ara Mach Itn" cried the Mongolians, and the match carried on. Then someone cried, "Mongol Imuktey Houchtey" and the fans froze as the young Miss Doda was placed upon her horse, with the pigtail trailing down her back, and rode onto the field. The one good thing to see was the Mongolians are learning the rules. They have been at all 4 All Asia Cups, and the visible difference is that now they are learning to use the rules to their advantage. The China team showed excellent sportsmanship. Even though they were down, they did not give up. Shilai led some inspired charges down the field, and the Chinese showed excellent camaraderie with a full contingent sharing time on the field. We were also most honored to see that Shilai had brought his distinguished father to the match. China is another team that has been at the All Asia Cup consistently since the very beginning, and their determination is bound to pay off in the future. An absolute nail biter... This was definitely one of the most exciting games of the tournament. Indonesia came out very strong and organized and put the first points on the board, but then Brunei fought valiantly and turned it around. Brunei was leading by one going into the last chukka. It was a battle that neither team will soon forget. Indonesia slowly found their composure again and tied the game. They scored again, and were up by one. Then Bahar charged the goal; the Indonesians backed it, and turned to attack. Princess Asimah turned on defense and took out the attacking Indonesian and backed the ball successfully. The fans were out of control on both sides. And as the dust settled, Indonesia had done it and claimed the Bronze. A brilliant match, honorably played. It just doesn't get better than that. Bronze Medal Indonesia with family and friends -- Indonesia now has a Gold, a Silver, and a Bronze from the All Asia Cup. Thailand takes 3rd Gold in All Asia Cup... Thailand wins the Gold again. Philippines fought a brilliant battle, but Thailand maintained their 1.5 goal advantage on handicap throughout the game. Fantastic interchange between Anthony and Adrian. Mikee Romero leading several inspired charges on goal, but the Thai Wall was just to strong to break. The real story of the match was played after the dust had settled... 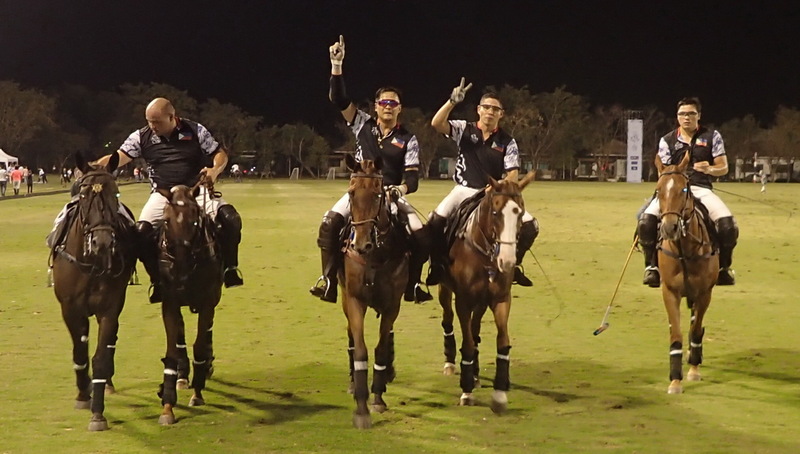 The Philippines Team lined up and executed "The Missing Man Formation" -- 4 riders abreast with a single riderless horse -- to honor the passing of Mikee's son and our polo friend, Miguel. In military aviation parlance, the Missing Man Formation honors a fallen aviator. The formation of 5 aircraft in echelon will appear on the horizon, as a single aircraft departs the formation as it approaches the parade. 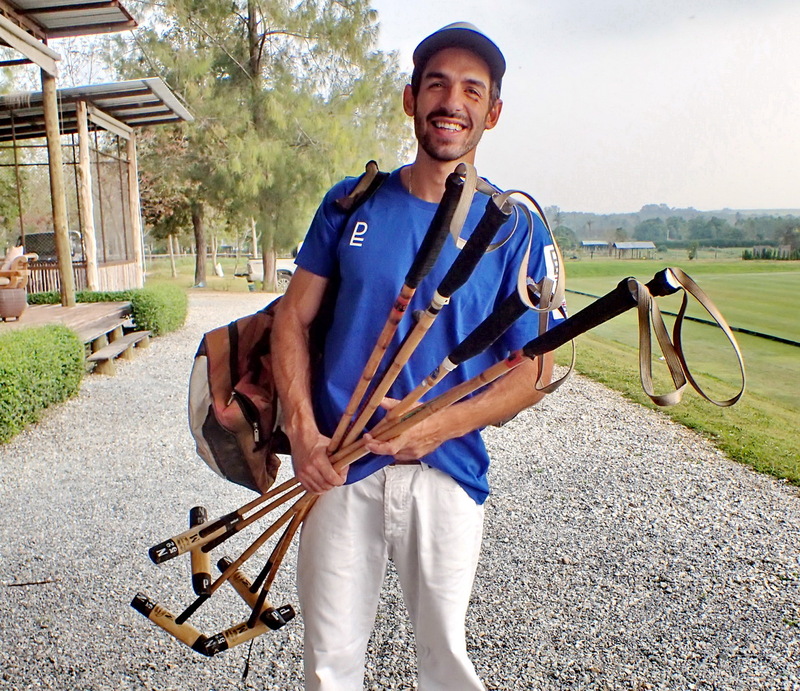 The significance of the time-honored tradition played out on the polo field before the thousands of spectators at the Final of the All Asia Cup was a fitting honor to our fallen comrade. And the tears in Mikee's eyes as he led the formation reminded us all how precious our family and friends can be. Farewell dear friend. Princess Azimah charges to defense and prevents an Indonesian goal. 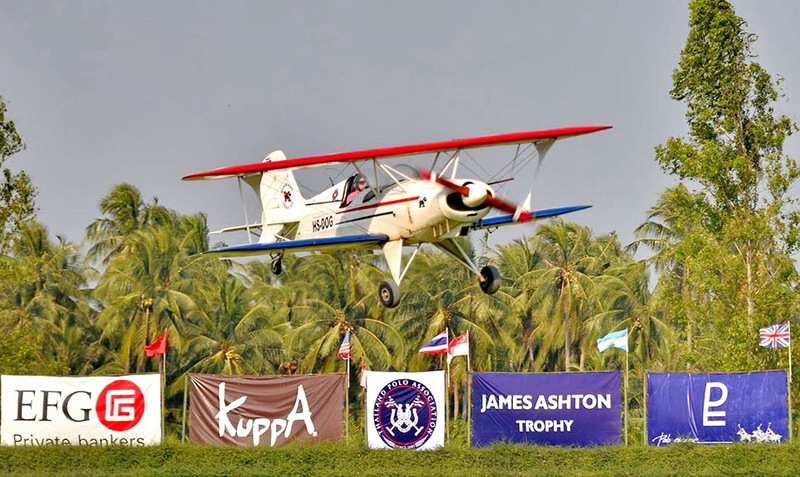 The Indonesia Team has been training hard at Polo Escape and SPP Pattaya. There are 2 new reserve players this year, and Curto put the team to the ultimate test on Tuesday. 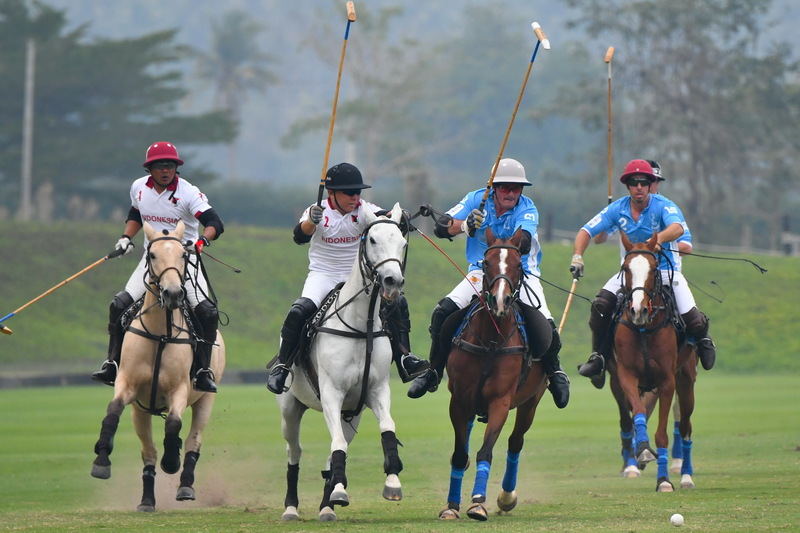 They went onto the field with remnants of their arch enemy "Anjing Hitam" and Pablo and Robin from Polo Escape. The theme of the match was "Saya Mau Maleehat Pirrrcayadiri" and we certainly did see that. The Indonesians were executing precision passes and cohesive drives to "Kiri" and "Kanaan" and they came out on top 6-4. Mas Bowo was not able to make the match, but he was following the progress closely from Bangkok. Curto took Bowo some Kuppa Cheesecake after the match. 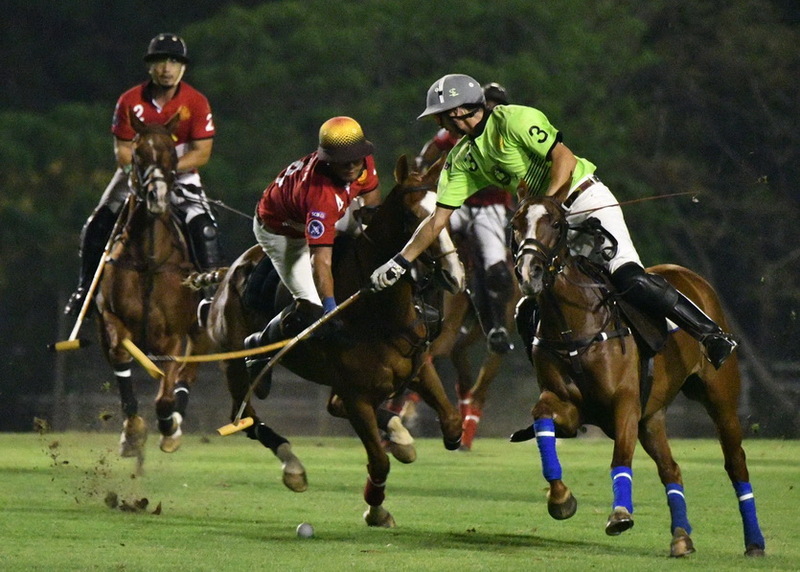 The Paisano Dragons are preparing for an assault on Polo Escape. There may be 3 teams on the field of patrons and players at various levels. 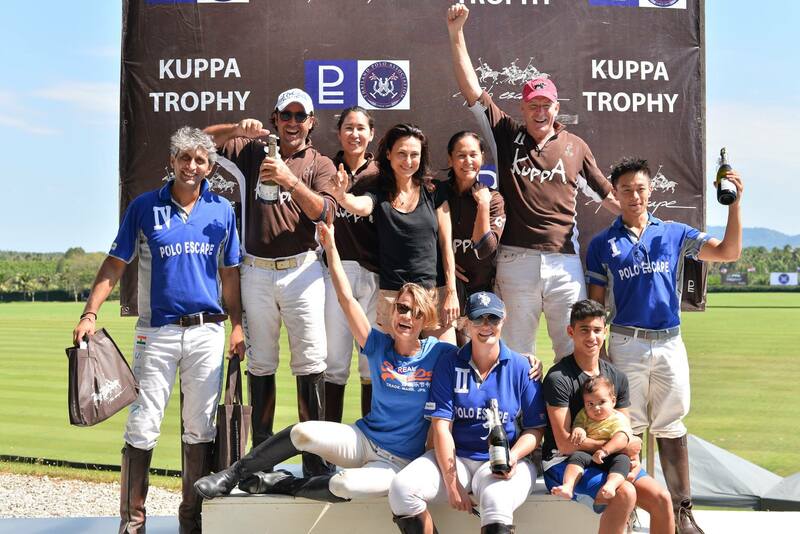 Kuppa finished to capture the Kuppa Cup in a stunning victory, despite the sudden last chukka surge by Paisano Dragons Nico Pepperoni Pieroni and Ronnie Lim. Photos coming soon. Meanwhile, King Power, Indonesia, Brunei and Philippines are ready to roll at SPP and VS for the Annual King Power Gold Cup. Miguel Diaz and Santi Lujan arriving shortly for the season. This was won by Prince Qawi's team from Brunei. No photos available. It was an exciting game for everyone. The previous day, we saw Brunei upset Singapore to take the Bronze Medal, and everyone was expecting Thailand to do the same with Malaysia. But Malaysia was on fire. They dominated the first chukka and took a strong lead. 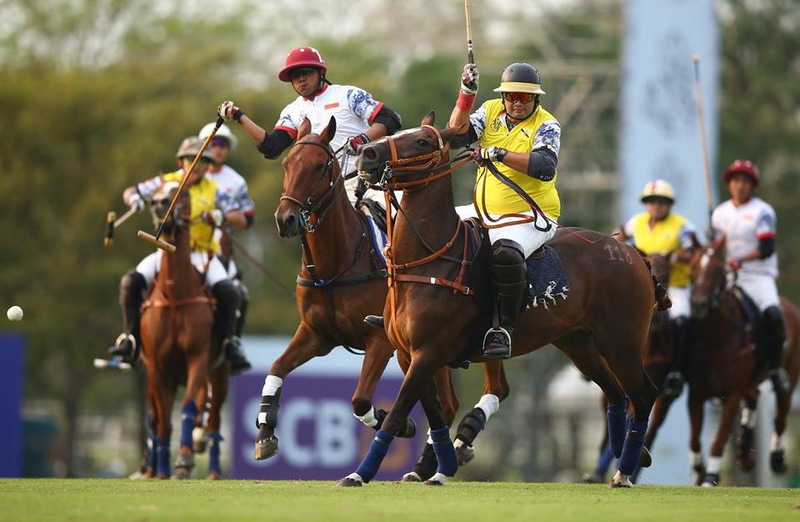 Thailand came back very strong in the second chukka, and seemed to be on track to overtake the Malaysians, but Malaysia was too quick, and they several times were able to send an unmarked man downfield to receive a pass and convert for a goal. It was hot and humid, and it seemed to be a game where conditioning would become all important. There were 2 controversial calls in front of the opposing goal. One should have given Top a hit from the spot, which instead was taken out to 30 yards. Top put it in anyway, but the real neck turner was the Malay defender riding straight over the ball right in front of goal as Top was setting up to tap in. This seemed to stop the Thai momentum, and from then on Malaysia controlled the game. 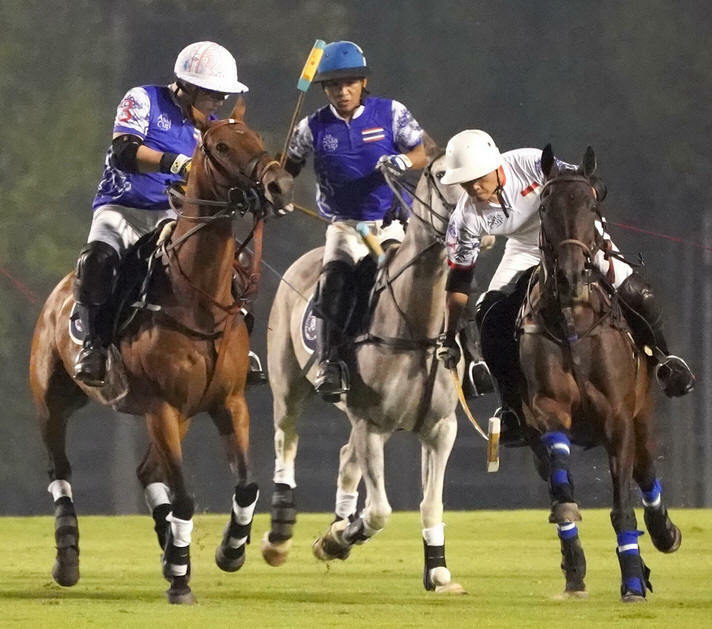 Thailand came back in the final chukka to close the gap to one goal, but the time ran out and Malaysia had the Gold, and Thailand would be awarded the Silver for SEA Games Polo 2017. The games are on. We have been following the Thailand team. On Day 1, Thailand soundly defeated Singapore 11-6. 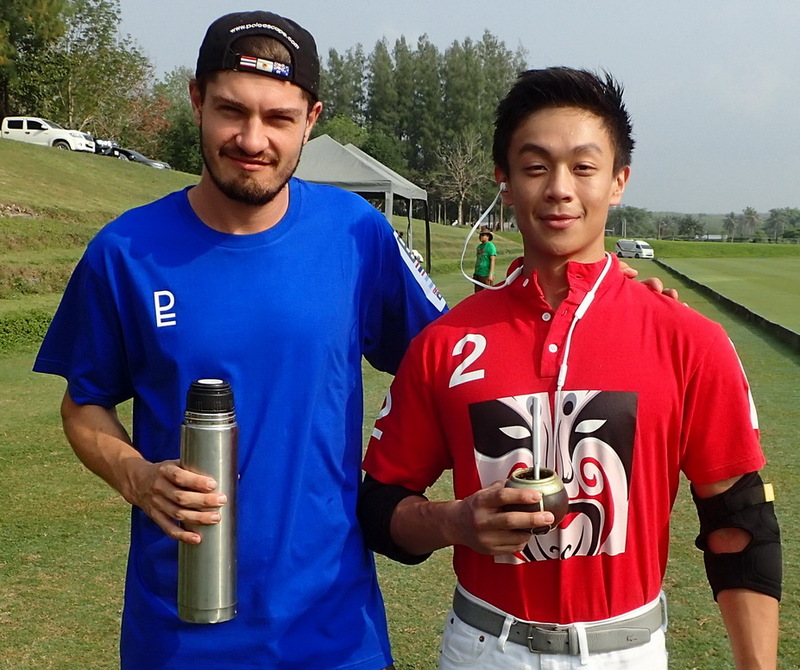 On Day 2, Thailand had a victorious meeting with Brunei with a final score of 10-3. All eyes are on Saturday morning's match at 9:00 AM between Thailand and Malaysia. This is the match that everyone has been talking about. 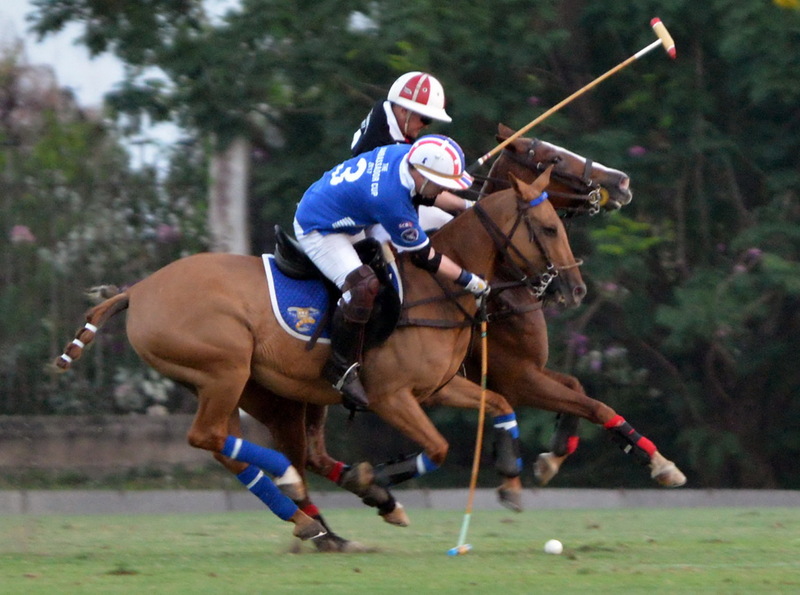 Malaysia has been playing polo for close to, if not over, 100 years, and Thailand for the past 16 years. There is a lot of depth to the Malaysian team coming from different clubs, but the Thailand team coming from one club. Malaysia took the gold in 2007 SEA games, but indeed, anything could happen this Saturday, as we watch these two teams size each other up. Don't miss it. 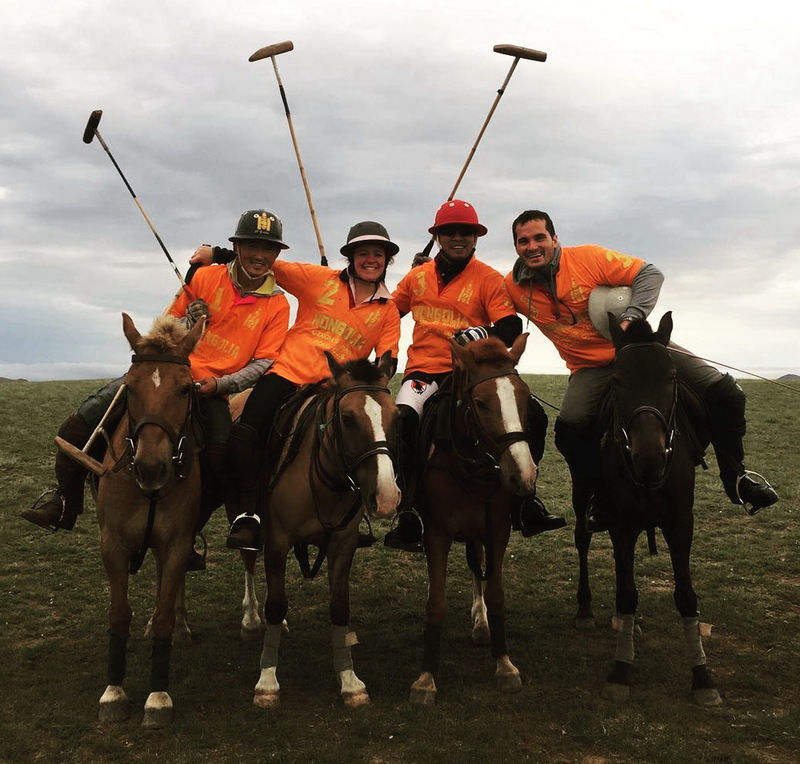 The Indonesian Polo Team was on the wild Mongolian Tundra this past summer at the Ghengis Khan Polo Club. 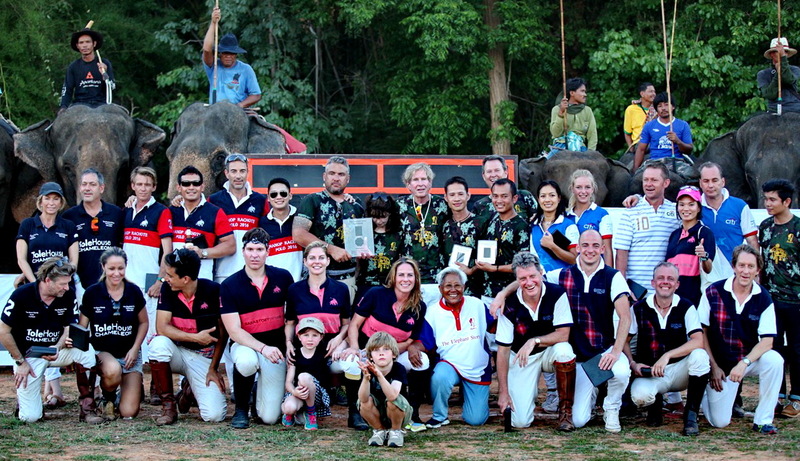 They have sent us several photos of their expeditionary polo adventure, and we will be sharing them with you shortly. 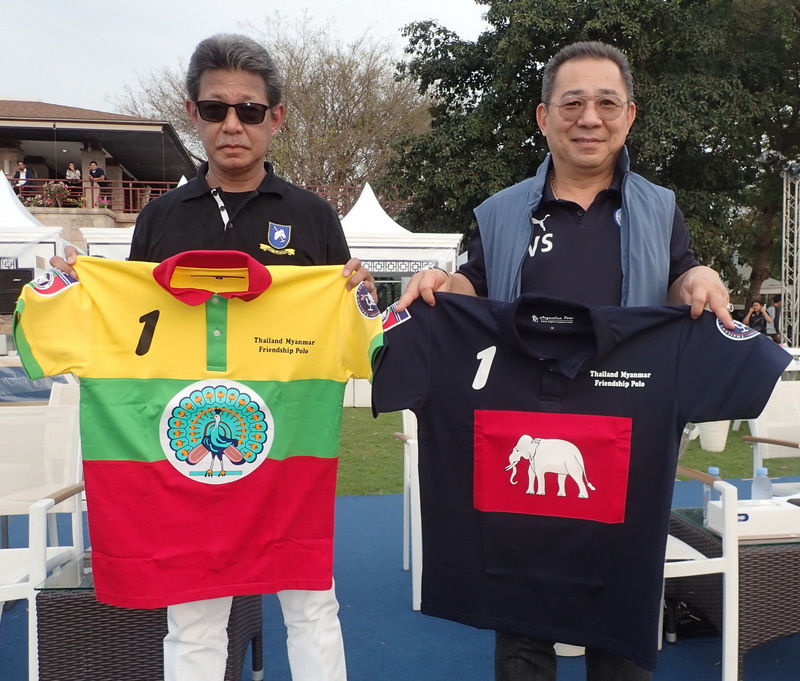 The sad news from Indonesia is that they will not be able to bring a polo team to SEA Games 2017. The reason is that Malaysia decided to change the handicaps down to a reasonable level too late, so they were not able to make plans in time to join the games. We are not sure of the reason that Philippines could not join, but the result is that it looks like 4 countries will be competing in the SEA Games 2017 -- Thailand, Malaysia, Brunei, and Singapore. (In the 2007 SEA Games held in Thailand, there were 5 teams -- Thailand, Malaysia, Singapore, Indonesia, Philippines). 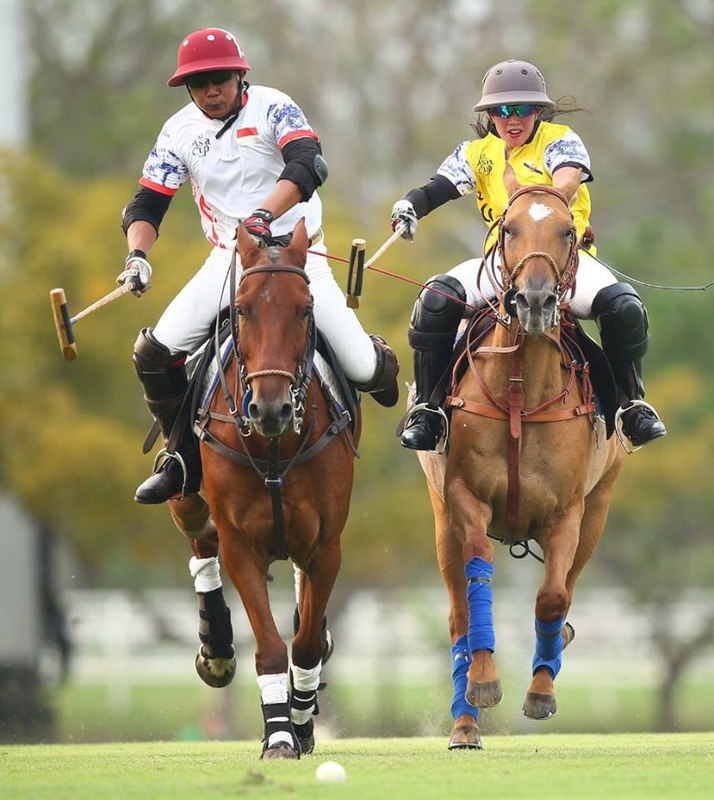 The Malaysian Organizing Committee for Polo in the 2017 SEA Games has confirmed to TPA that the 2017 SEA Games Polo will be held at the 4-6 Goal Handicap Level. Khun Top has confirmed that a letter from Malaysia was received sometime in May to confirm this very good news. This decision leads the way for possibly a record 6 teams competing in this playing of the SEA Games in Malaysia. Malaysia is to be commended for this excellent decision to keep the SEA Games inclusive of all the polo-playing countries in ASEAN and further the long-term goal of preparing Asia for the day that polo will once again be played in the Olympics as it last was in 1936. 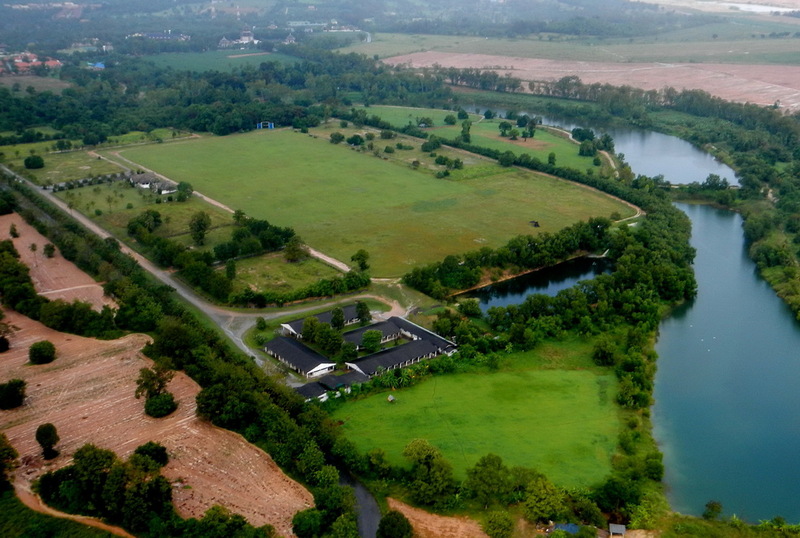 The host hotel and only hotel in Buri Ram is the gorgeous AMARI BURI RAM where we will have a block of rooms for Elephant polo. Number of rooms 30 rooms. Contact Khun Nuntana at Nuntana.l@amari.com to book your rooms from the room block. Rooms will be payed for by you and are not part of your team fee. Rooms include breakfast. 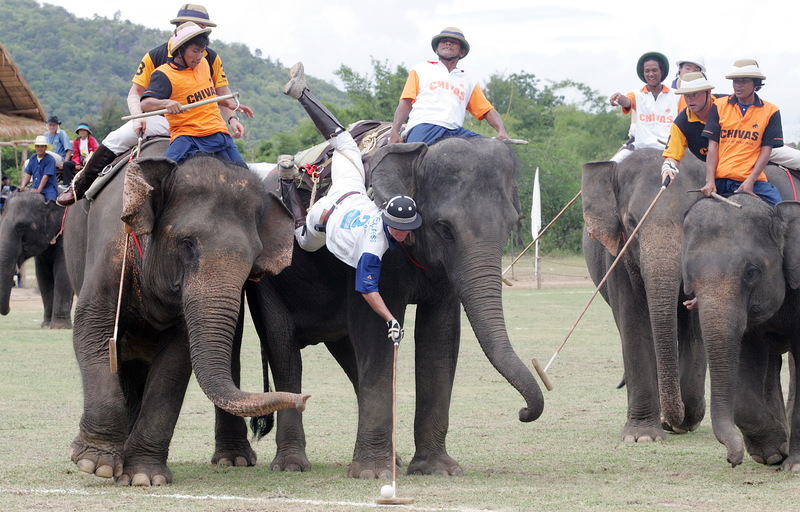 We will spend the whole day at the pitch and elephant village so pack for a full day out. game 3 -- PITCH PARTY!!!!!!!!!!! 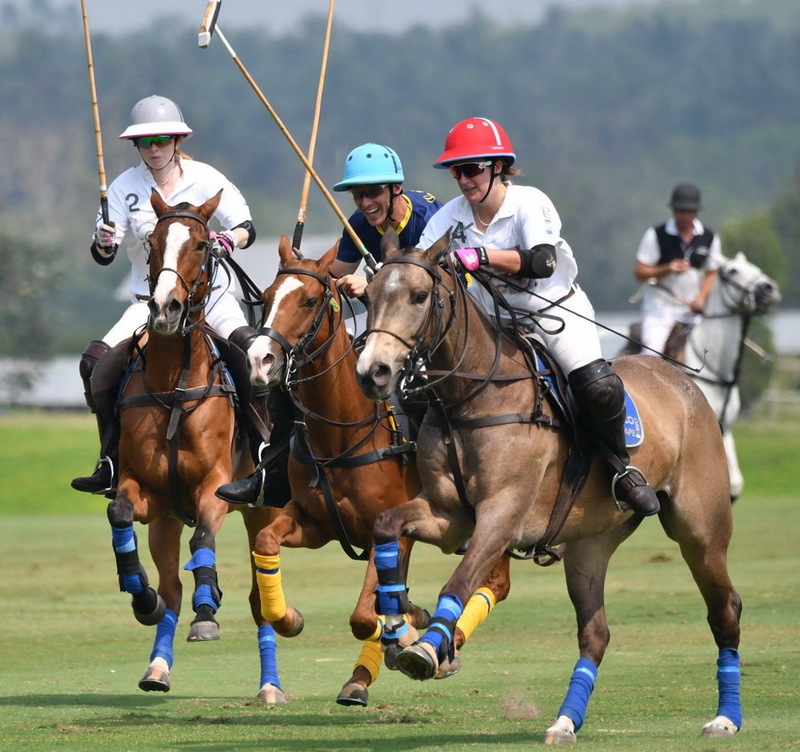 After hearing that 11 teams were coming to play at the Ambassador Cup and that there was no room for Polo Escape to join, we now have 6 teams to play in the Annual Ambassador Cup at VS Sports Club. 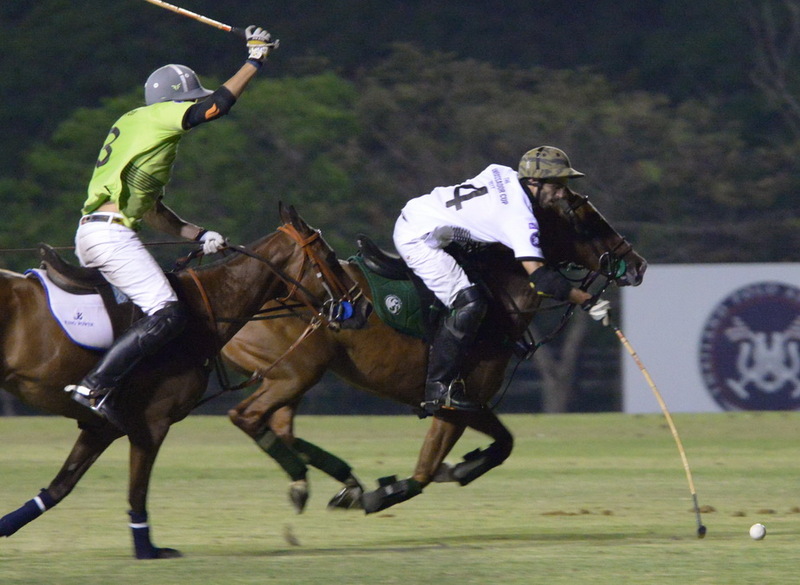 DAY 1 -- The Paisano Dragons defeat Selangor, and King Power take down SPP. DAY 2 -- An exciting match where SPP surprise the attack mounted by James Beh and his team. It came down to penalties, and SPP taking advantage of the opportunities given to them. 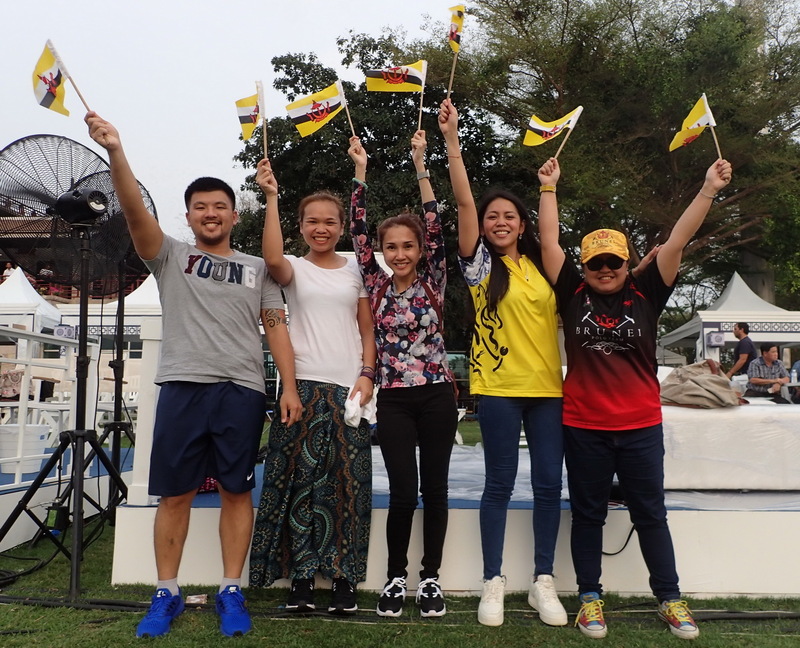 The Filipinas team with a very exciting match against Selangor. Saladin and Anthony going at it until the final bell and Filipinas left standing. DAY 3 -- King Power in a very heated match against BP, but an early lead sees them through to victory. Paisano fight valiantly against Filipinas, but Filipinas control the field and the secret weapon up front delivers a lethal shot at the end of the second chukka to signal the end for Paisano. DAY 4 -- And what a day it was... Two very exciting subsidiary finals for the thousands of fans. 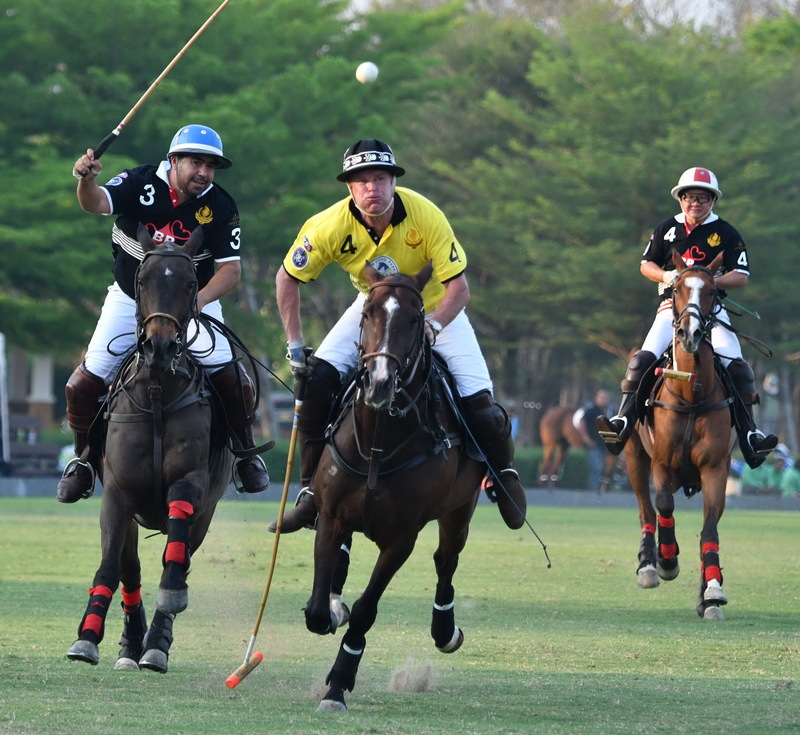 First was the Malaysian contest between BP Polo and Selangor Polo Club. Back and forth until the final bell with Selangor winning by a single goal 7-6. The game kept everyone on the edge of their seats. Then to the big field, where SPP faced off against Paisano Dragons. SPP started with a 1/2 goal on handicap, and they scored the first goal to take the lead to 1.5, but then the dust never settled. The Dragons would surge, the SPPs would reply. Always the game was within a half point, but SPP never relinquished the lead. In the final chukka, SPP sealed the deal and fired in two more goals to claim a 7.5 - 5 victory over the Dragons. THE FINAL -- The theme was "Blue Jeans" and dressed in blue everybody was... Delicious food and fun for everyone. The Final began at 6pm with King Power and Filipinas on the field. King Power controlled the entire game without question. Filipinas managed to coordinate a bit in the final chukka for a 8.5-8 closure. 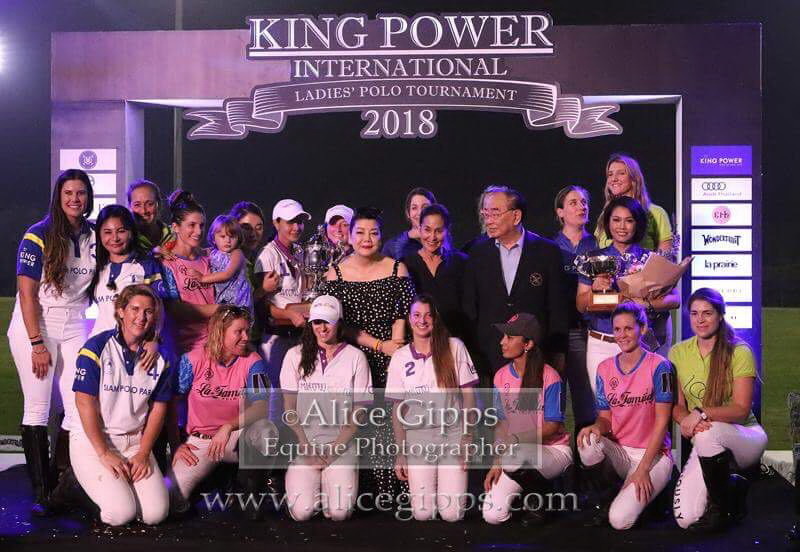 The King Power team was the same team that may play the SEA Games in Malaysia, so if they go, it could be an interesting meeting. 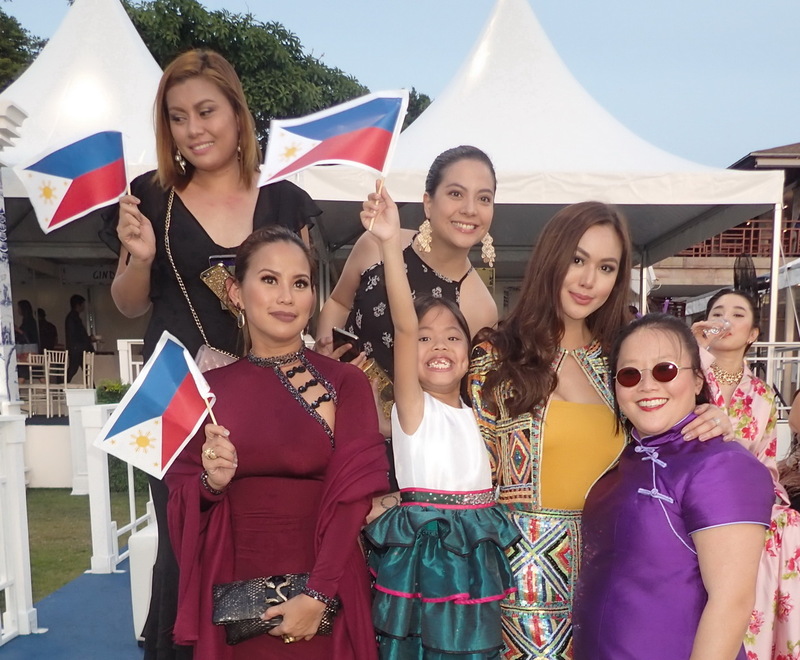 After the game, a delicious buffet on the edge of the field with musical extravaganza performances by Thai and Philippine Singers. 5pm -- Between 3rd Place teams -- Selangor claims 5th place. 6:30pm -- Between 2nd Place teams -- SPP takes 3rd place. Dear Friends, Only a good week to go !! Many familiar faces plus some fantastic new players and lovely followers have confirmed attendance !! 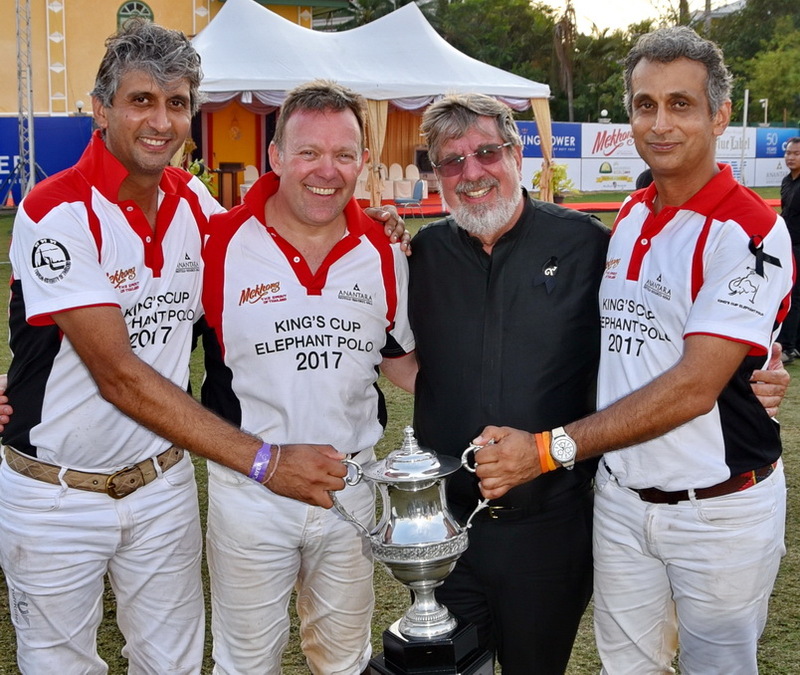 The Kingpower and 2016 winning team will appear in their usual strong formation, Charlie and Olo are this year supported by fellow All Blacks Stu Wilson and Murray Mexted, then a new duo of 3 goalers flying in from Argentina specially for the event, Uday and Angad arrive fresh from an unbroken winning streak across India on horsebacks, Lars and Manish are cheating on each other, Chris Stafford now recruiting an Arsenal soccer pro to re-inforce the Blue Label team, Wael and his Arabian knights trained hard at the Dubai polo club and are eager to finish in the top 3 this year, Darren mixing up the CITI team with a weekend surprise to be confirmed. Chris still shuffling and reshuffling the players for teams The Devil, IBM and Benihana of Tokyo. Final player constellations of the 10 teams to be announced during the opening event Wednesday 8 March by Chris Stafford. On Wednesday -- training start as of lunch time on Wednesday and whilst this is still set up day, we will have some cold beers and Sauvignon Blanc for you at the pitch as always. Handicapping event starts at 7pm Wednesday at the roof top bar Attitude at the AVANI Riverside Hotel, dress code casual/polo shirt. During that evening event you will get your 2017 polo team shirts and your dinner suit jackets for the gala. On Friday -- we sleep in (!!!) whilst some 1000plus kids are enjoying ele education day at the pitch. We will start games around 2pm and play until 10pm under floodlight. We are introducing the High Ball Shoot Out Cup. That will happen at 8pm, each team selects their best player, sudden death concept, hit the ball over a 25cm, then 50cm, then 75cm and increasing level target line that is 8 meters wide, distance to shoot from will be determined by The Silver Fox Raj Kalaan and a nice cup and more will be presented to the winning team. On Saturday -- we get up late again (hope you are ok with that) whilst in the morning at the pitch some friendly soccer games of BKK teams take place, we start playing eles at 2pm. In the afternoon Great Gatsby themed ladies day, a 40 model fashion show and a grand historic war elephant parade and performance take center stage as well. We will play again under flood light till 10pm and the 45 tents and 5 VIP lounges will create a relaxed riverside festival atmosphere with music, food and drinks till midnight. 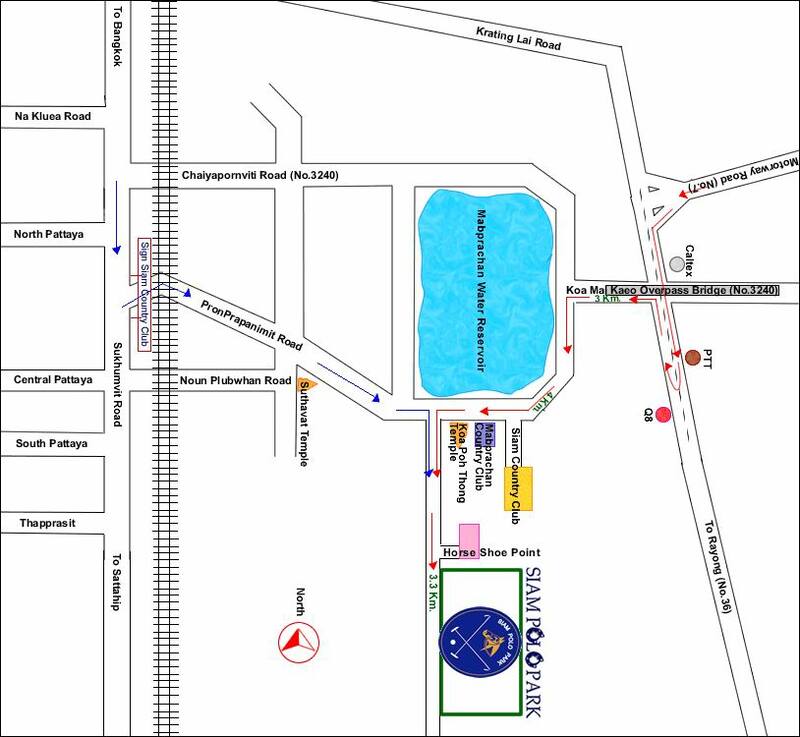 Post Address: VR Sports Club, 88/1-7 moo9 OnNut-Teparaj Road, Preng, Bangbo, SamutPrakarn 10560 Thailand. 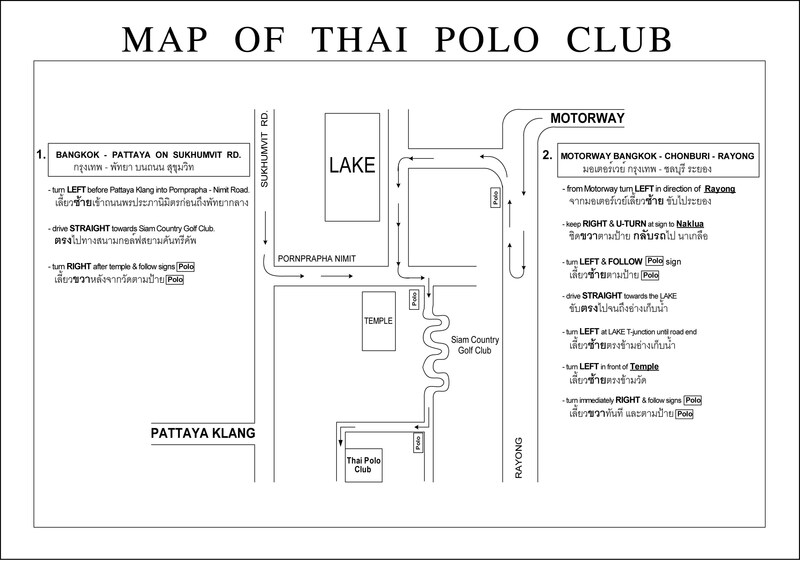 Post Address: Siam Polo Park, 88/1-7 moo9 OnNut-Teparaj Road, Preng, Bangbo, SamutPrakarn 10560 Thailand. Old Address (of former club): 100 M.9, T.Pong, A.Banglamung, Chonburi 20150. Fax: 66+38734940. Post Address: 111 Polo Drive, Pattaya, Thailand. * apparently, not all are welcome here, so check first to see if you are welcome. Post Address: No. 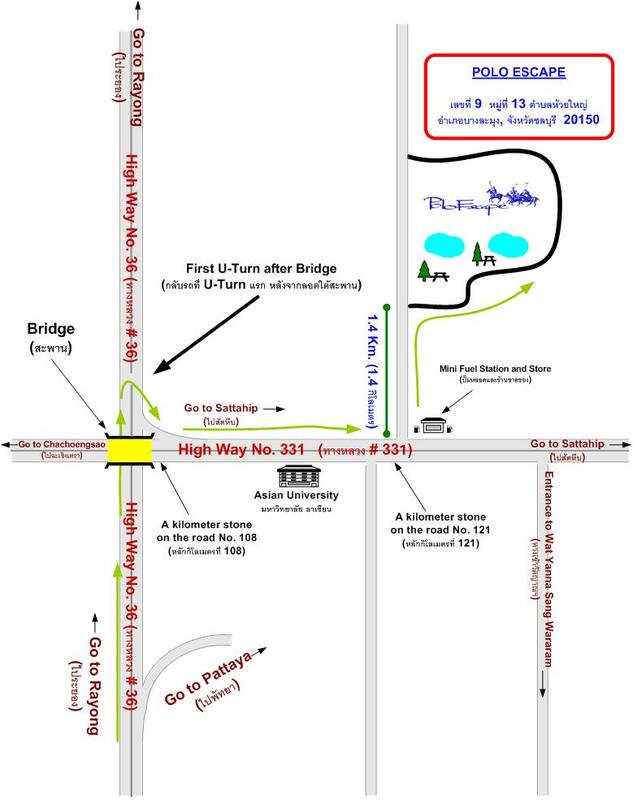 9 Moo 13, Tumbon Huay Yai, Amphur Banglamung, Cholburi, Thailand.